Recettear: An Item Shop's Tale is a wonderful little game that revolves around a girl named Recette Lemongrass and the item shop she runs out of her house. Recette's otherwise easy life of eating and sleeping is interrupted one day when a fairy loan-shark named Tear arrives from Terme Financial to collect on debts Recette's father incurred when he left to become a great hero. Tear gives Recette a chance to pay back the loan instead of repossessing her house by opening an item shop out of it instead, to sell things to adventurers in a typical RPG town. The amount that must be paid back increases each week, starting out with a 10,000 pix (the game's currancy) first payment due on day 8, and ending up with a whopping 500,000 pix fifth payment due on day 36. If you fail to accumulate enough pix for any of the five weekly payments, Tear repossess your house and you move into a cardboard box before starting over from a previous save. The first time I played I didn't realize there was no sort of auto-save feature, so I had to start back over from the beginning because I hadn't saved my game at all. Each day in the game is split into four time slices, after which you automatically go to sleep for the night when you return to your shop. Running the shop takes up one slice, traveling from the shop takes one slice, and going adventuring in the dungeon takes up two slices. You can do pretty much whatever you want as long as you have time for it; for example, running the shop four times during the day to sell off stockpiled items is perfectly valid, but you can't do anything else that day. A little over half the game involves running your shop to buy and sell items to and from customers. You can, in fact, complete the entire game without ever venturing into a dungeon -- though that leaves you missing a good portion of the game. You start with three counters, which each hold four items. You place whatever items you want on the counters, and customers will come in to buy them. Placing popular items on the counter in front of the window helps to attract some customers, with medicinal items and food being a pretty good draw. If a customer sees something they want to buy or sell, a screen pops up where you can suggest a price and haggle with them. Haggle too much or ask for too high of an initial price and they will leave, wasting your precious time in the process. Each item has a base price, and when haggling with customers you can see what percentage of that price you are currently offering. The first day is all gameplay tutorials, and in those tutorials they suggest that you try to buy items from customers at 40% of the base cost and sell them at 130%. In practice, selling a little lower and buying a little higher is much more beneficial though as you get an increasing experience bonus completing your transactions on the first attempt instead of haggling. As your experience increases, so does your merchant level, which unlocks all sorts of things such as shop expansion, better items to buy from the market or guild vendors (and thus higher prices and higher profit margins), shop customizability, etc. When you leave the shop, the map of town is pretty simple with only a few places to visit. The Pub, Chapel and Town Square really serve no purpose other than to facilitate story scenes with various adventurers. The Market lets you buy and sell goods, though you don't get very much money at all for selling there. Buying goods here and reselling them in your shop is a quick and easy way to make some money though. You can also buy and sell goods at the Merchant's Guild (mostly weapons and armor), but you also come to the guild to expand your shop or fuse items together into better items. I wish there were a few more things to do and interact with in some of the locations though. The item fusion is fun, but rather limited in the fact that all the fusion recipes take rare items that you can only rarely find in dungeons. I would have liked it more if fusion was expanded upon a bit to let you fuse multiple weaker items into one stronger one or something. It's not that it's bad, just that it's sort of limited. By time I obtained enough of the various items to complete my first couple of fusions, the items I was able to make through fusion were already inferior to the stronger items I had unlocked to buy from getting enough experience. Granted, much later in the game it becomes a lot more valuable to fuse things, but as you unlock the first few tiers of fusions you'll realize that they're mostly wasted. Now, the final place on the map is the Adventurer's Guild, and this is where you can go to enter dungeons. As you meet and interact with some people in your shop, in town events or in dungeons, you can obtain Adventurer's Guild Cards from them. Afterward, you can hire them to travel through various dungeons and let you tag along to pick up items and bring them back to sell. There are 8 different adventurers in total, each being distinct and playing differently from each other. Sorcerer, archer, swordsman, even a robot... there's something for everyone here and multiple choices. You can even use all of them, though I found it much easier to pick a couple (Tielle the Archer and Nagi the Lancer were my favorites) and level them up a lot rather than playing with eight lower level characters. When you enter a dungeon you get plopped down somewhere in a randomly generated maze, controlling whichever adventurer you hired. It's standard hack and slash here, from a 3D-looking overhead view. I have to admit that the dungeon crawling was a little better than I expected from a game about an item shop! There are 14 different types of enemies, which come in multiple colors to denote stronger versions of the same. Most drop a common item and a rare item, though some have a couple of additional items added to their drop list. I don't recall ever seeing an enemy drop more than one item at once, however. In addition to the regular enemies, there are also bosses at the end of dungeon segments. The boss fights are usually well balanced and fun, but you have to pay attention to the patterns or gimmicks that they use and plan accordingly sometimes. The second boss, for example, walks around with a lot of health and hits you with frontal attacks occasionally. Red and purple mushrooms pop up out of the ground, and he walks around eating them once in a while. Well, all of your attacks do like 1 damage to him, but if you hit him while he's eating a purple mushroom you can do additional damage. If he eats a red one, however, it will heal him... so you have to run around and preemtively kill all the red ones while avoiding his attack and waiting for him to chomp on a purple one -- and then run in and smack him a few times before he finishes. Recettear: An Item Shop's Tale can be beaten in the good part of a day, but don't think that means there is no replay value. In fact, by time you beat the game you won't even have half the things in the game unlocked yet! That's because there additional game modes unlocked after you "beat" the game. New Game+ allows you to start the game over with all your items and levels intact. Survival mode allows you to see how long you can last as it keeps the weekly debt increasing forever until it overwhelms you completely, and Endless Mode allows you to play the game endlessly with no debt. The graphics are fun and cute, using 2D character and enemy sprites on what appear to be 3D backgrounds. The story scenes between Recette and other people around town all use a static portrait of each character and one pops in from each side as the character talks. It's been done to death but I really like it. The background music is upbeat and joyful and really works well with the cute graphics, as do the sound effects. The addition of short clips of characters saying a few words in Japanese when they're talking just seems so fitting for the style of the game as well, and I'm really glad they included it. It does get a little stale eventually after selling the same items to the same customers, and running the same dungeons over and over, but there's just enough variety to keep me from shelving it. In Endless Mode you'll spend more of your time hunting rare items from dungeon bosses to complete your Item Encyclopedia and get every item in the game, and less time sitting in your shop reselling to customers over and over. The game is also relatively inexpensive at $20 currently, and offers a lot of bang for the buck. Minimum system requirements include Windows XP, a 1.7GHz processor, 256MB of RAM, 700MB Hard Drive space, and DirectX 8.1-compatible video (64MB+) and sound cards. Cons: Needs better graphics, more enemies, and a storyline overhaul... killer pickles and hotdogs? BurgerTime is a classic arcade puzzle game created by Data East in 1982. It was ported to many different systems over the years, of which I have played two of the different ports. I used to enjoy playing the Intellivision port of BurgerTime when I was a kid, so when I found this Nintendo Entertainment System version online for a couple dollars I picked it up in hopes that it was similar to the Intellivision port. Much to my delight, I didn't notice any differences at all and the game was just as I remembered it. The game consists of six levels that each takes place in a single screen. Each level is filled with various platforms and ladders that contain various hamburger ingredients (buns, burgers, lettuce, etc). Walking over the length of an ingredient causes it to fall down to the platform below, and walking over an ingredient on the lowest platform causes it to fall onto a platter below. The levels contain between 2 and 6 hamburgers to complete, some with as few as 3 different ingredients and some with as many as 8. You play as a chef named Peter Pepper, and your goal is to make these perfect hamburgers while fending off various... food monsters... (Mr. Hot Dog, Mr. Egg and Mr. Pickle). While navigating the ladders and platforms in the game, the enemies will try to run into you and kill you; later levels are arranged in ways that make it easier for you to get trapped in corners and harder to work on making your burgers. You have a few shots of pepper that you can shoot at an enemy (with either the A or B button) that will stun them for a couple seconds, but these shots are limited in number. Occasionally a powerup will appear on the screen (ice cream, fries or coffee), and picking up one of these will give you an extra shot of pepper in addition to bonus points. Dropping ingredients onto enemies will kill the enemies and make them respawn at the top of the screen. Dropping an ingredient with an enemy standing on it beside you will make it fall down an additional platform level and award you bonus points, and that's the key to getting higher scores. Obviously with enemies that close to you it's more dangerous and you're more likely to get hit or trapped, so you have to plan ahead where you are moving and pay attention to how the enemies move and follow you around. BurgerTime is a pretty simple game that's unique, and well executed for the most part. A maze-like area with only a few enemies to deal with makes it remind me a lot of Pac-Man, which is never a bad thing. The controls could have used a little more work though. Moving from ladder to platform is often a little glitchy -- often you will be one tiny little step up or down a ladder and be unable to move to the platform on either side. By the time you realize you're hung up on the ladder, you may be hit by an enemy that was following you and die unnecessarily. It's not game-breaking and you will get used to it, but it's always annoying. The graphics are really simplistic, with only a couple frames of animation and limited colors. Some of the ingredients are hard to even tell what they're supposed to be, despite being rather large hamburgers. Is that a tomato? A piece of cheese? A middle bun segment? Who knows, not that it matters for gameplay purposes. I wouldn't even know what the enemies were supposed to be if I hadn't read it in the instruction manual. At least the main character is easily recognizable as a chef with his white hat and apron. The platforms are simple lines and the ladders are made up of wide equal signs -- but we're not playing this game for it's brilliant aesthetics. The sound effects are typical for an older Nintendo game, synthesized beeps and blips like Donkey Kong Classics or the original Mario Bros (not Super Mario Bros!). The background music is a little better, fast paced and upbeat. It sounds like it belongs in an arcade cabinet, but that's because it really does. Pretty average, but you cant expect much when you consider the game was made in 1982. Overall BurgerTime is a fun little distraction, and fills the same casual gaming role as Tetris or Pac-Man. It's different enough to be interesting, fun enough to play, simple enough to be easy to get into, and short enough to complete in a reasonable time period. When you get to the end of level 6, it just starts right back over at the beginning and you play it again. It's an average game that's got enough going for it to be worth picking up, especially since it can be found so cheap online. Gun.Smoke is a single player, top down scrolling shooter released by Capcom for the NES in 1988. Unlike most scrolling shooters which are based in space and you fly some sort of ship around, Gun.Smoke is based in the wild west during the gold rush era in 1849. You take on the roll of a lone gunman who comes to the small town of Hicksville to save it from a gang of outlaws known as the Wingates who have been terrorizing and raiding the town. 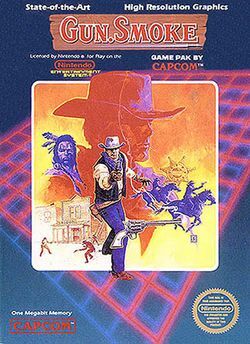 This game has nothing to do with the television show Gunsmoke, which is probably why Capcom separated the title of the game with a period. To accomplish this goal, you start out with a couple of pistols. By collecting bags of cash, you can eventually buy a shotgun, a machine gun, a magnum and a smart bomb from one of the few NPCs that are standing around the level. The default pistols have unlimited ammunition and shoot as fast as you can push the button. Pressing the B button fires your weapon up and to the left, the A button fires it up and to the right, and pressing both of them at once fires straight ahead of you. All of the other weapons have a set limit for their ammunition, but you can collect more ammunition from fallen enemies or from destroying barrels on the map. The shotgun is nice as it shoots a spread shot that can clear multiple enemies at once. The machine gun fires a continuous spray of bullets, and the magnum fires a strong exploding shot. The smart bomb is particularly helpful, even though it's not a weapon in the same way that the others are. Instead, when you get shot it automatically kills every enemy on the screen instead of killing you. You can only carry one of these at a time, but it's definitely worth it. Other power-ups include a horse which lets you absorb a couple of extra hits before dying (otherwise you die in one hit), a rifle which increases the range of your shots, boots which increase your movement speed a little bit, and a POW icon that kills every enemy on the screen. There are also two different colored pinwheels that give you an extra life or grant you temporary invincibility, as well as a cow skull that you should avoid picking up as it reduces your power. In each of the 6 levels there is also a Wanted Poster that is usually in one of the barrels, or hidden invisible right beside one. You can also purchase the wanted poster from one of the shop NPCs that you come across during the level. If you don't obtain a wanted poster, the level will continue on forever and you will never reach the boss battle. After picking up the poster, you will enter a boss fight the next time the level loops around to the correct place for the boss to appear. Some of these bosses are pretty easy, while others (like the second boss, Cutter Boomerang) can be mildly challenging. I seem to be a giant failure at avoiding his boomerangs and always end up losing a life on him, while I rarely die to the pair of brothers that make up the final boss. Overall Gun.Smoke is a pretty decent shooter, and it has some decent graphics for it's time. From an old western town and an Indian village to a mountainous area and another level with rivers, there's a little bit of variety to the level settings to try and keep things interesting. Unfortunately like most NES titles, there's not much to work with, and on top of that the gameplay is the same throughout so it really doesn't help relieve the repetitiveness any. The background music is actually not half bad, contributing nicely to the overall wild west theme of the game. It's nothing memorable, but it's fitting and worth listening to rather than muting. While there's only a dozen or so different enemies aside from the 6 bosses, at least they all look distinct and different from each other. They also attack differently and some of them move differently as well, but I wish there was a little more variety here. Gun.Smoke could have also really benefited from a 2 player mode, which they unfortunately didn't include. The difficulty level is just about right, but you also have unlimited continues where you can start over from the beginning of any level after you've exhausted your extra lives. Gun.Smoke is a fairly solid game, and one that I break out along with Contra and Jackal for a play-through every once in a while. An easy recommendation if you can find it for a decent price.